Getting from Krabi to Phuket can be done in multiple ways depending on you style, mood and budget. The beautiful and dramatic nature of Krabi's mountains and islands can be overwhelming for many so a trip to Phuket with the more developed beach resorts of Phuket can be the solution. Or you might just need to get to Phuket International Airport. Getting from can be done overland by driving around the Phang Nga Bay or going direct by sea across Krabi to Phuket via Phi Phi Island. The ferry route takes you through some of the most dramatic island scenery in Thailand and the road trip gives a similar great trip on some of it's prettiest roads. Either way, this is not a trip to stress about, it is a visual adventure. Krabi to Phuket by ferry is actually 3 routes as you can take a boat from Ao Nang, Krabi Town or Koh Lanta to join with the Phi Phi to Phuket ferry. The Ao Nang beachfront district takes in Railay Beach and Klong Muang. The Saladin ferry port is the meeting place at Koh Lanta and Krabi town is where you arrive if you are coming from Krabi Airport, Koh Samui, Koh Phangan or the train station at Surat Thani. All the ferries take a morning crossing, Koh Lanta and Ao Nang depart at 8.30am and Krabi Town departs at 10 am. The Phi Phi ferry of your Krabi to Phuket journey starts at 2.30 pm and takes you out through the main channel between Phi Phi Don and Phi Phi Ley Island on to Rasada Pier in Phuket. The worst of the monsoon winds are in June and September so the bus trip around Phang Nga Bay is often more comfortable. Krabi to Phuket can be done in a swash buckling speedboat blast across Phang Nga Bay. It's not a short trip so the best season is the calm weather with North Easterly and following winds of December, January, February, March. 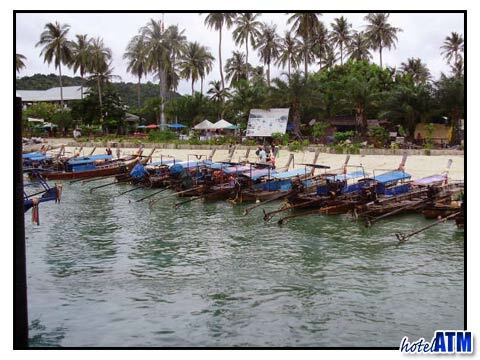 All the ferries and speedboat can be organised here at Krabi to Phuket transfers. You will get a saving by taking the Krabi to Phuket local VIP bus. It will by about the same time or less as the tourist minibus as it goes from the Koh Gao bus station in Krabi to the Phuket town bus station in Phuket and has no stops except for the standard 'comfort stop' in Phang Nga. These buses can be larger than the minibus but the down side is that you must make your way out to Koh Gao bus station which is 9km outside Krabi Town. For an original Krabi to Phuket road trip you could take the local Songtail town hoping from town to hamlet to town. (The songtail bus is the open air converted truck that takes villages from home to market to the next town. The songtail stops for anyone who hails in the country but there are specific stops in town.) It would be an amazing way to do the Krabi to Phuket journey but would take you all day and the rest to complete. If all these travel scenarios leave you cold then there is always Krabi to Phuket by taxi. Get your hotel to arrange an exact transfer to where you want to go in Phuket. When time is precious there is no substitute for getting your travel arrangements right, enjoying time at the destination you are visiting. There is more information at Phuket transport link where you can find out more about 'Phuket Phi Phi', 'Arriving at Phuket Airport', 'Traveling to Phuket Island' and much more.